Hey! It's time for another 3CE review! It's been way too long. This time, I have the 3 Concept Eyes (3CE) "I'm Good" Pink Mascara and 3CE Shimmer Stick in #Peach to review. In case you didn't know, 3 Concept Eyes is a cosmetics brand started by the famous Korean brand, Stylenanda in 2009. It features an amazing and wide array of beauty products that are not only super adorable but multifunctional and colourful as well! First up is the 3CE "I'm Good" Pink Mascara in #Black which I am in love with - because it's PINK! When the limited edition pink series was launched by 3CE, I really wanted it cos it's so pretty! The packaging is similar to the typical black 3CE packaging, except this one is in a bright neon pink. This mascara promises perfect dolly lashes in just one stroke. This mascara also curls, lengthens and does not smudge. This mascara is triple-coated with polymer and works against oil and moisture, making it an all-proof mascara. The brush is a minimum C-Curl brush that smoothes lashes all the way down to the roots and allows the formula to adhere to the lashes better. 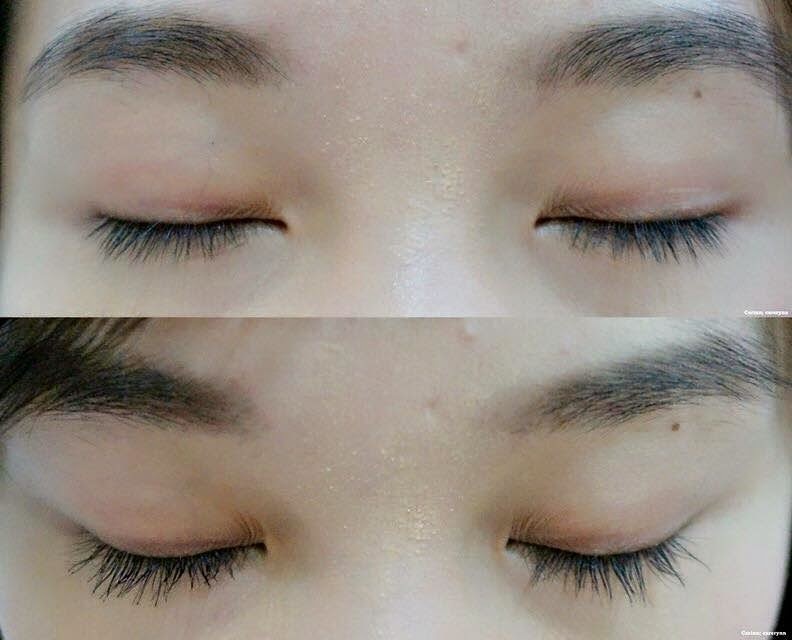 Your lashes will look natural even after re-application without bundling or clumping effects. This is the C-Curl brush. If you noticed, one side is flat to push your lashes up while the other end is slightly curve to give a curling effect. Use the flat end first before using the curved end for optimal results. Now, this isn't the first time I tried a mascara from 3CE. I've also reviewed the 3CE Fixer & Mascara previously and you can read all about it here. How I like to use my mascara is I usually curl my lashes with my trusty eyelash curler first. As you all know, I have super stubborn lashes so curling before applying mascara is a must for me. Apply a generous layer of the black mascara liquid to the flatter end of the wand and slightly stroke up and down your lashes in a zig-zag manner. After that, flip the mascara wand around and use the curved area to give your lashes even more curl. 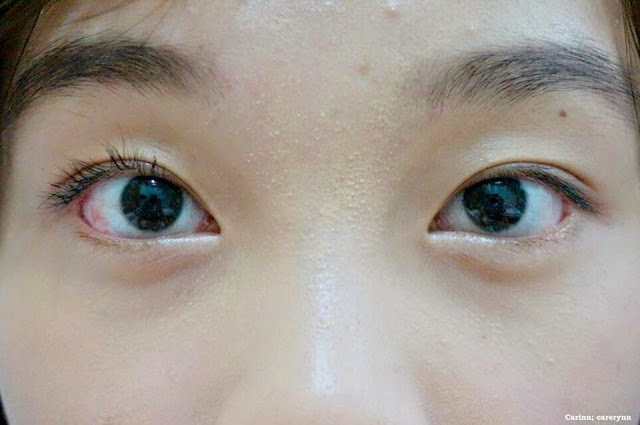 See how lifted my left eye is after applying the "I'm Good" Mascara! My eye definitely looks more lucid-clear and well-defined as compared to the eye without mascara. Also, my lashes look more separated but still looks natural. The mascara definitely does what it says and really does lengthen the lashes! It does not appear thicker but to be fair, it was not mentioned anywhere that this is a volumizing mascara. The results is quite impressive after just one coat. Build on a few more coats and I'm sure you'll get even more impressive and long lashes. The mascara lasted me all day without smudging. Since it is waterproof and oil-proof, you'd think it's a hassle to remove right? Wrong. I used my Mario Badescu Eye Makeup Remover Gel and in just one swipe, I could get almost all the main traces of mascara off! Saves time and product as well. Wondering where to get this limited edition Pink Mascara? You can get it from Fabulos Malaysia HERE for only RM69! Fabulos Malaysia started just barely 5 months ago in Decemer 2014 but they are a fast growing to become one of the leading e-commerce companies in Malaysia. Not only do they carry beauty products, there are also various categories such as Fashion for both men & ladies, mum & kids products and more! They are not only selling products but rather providing a complete, trustable, efficient and trendy platform of information and service to the customers. Fabulos Malaysia is an up & coming website and there will be more products from them next time! Look out for my next 3CE post from them! What happened to your eyes with the red red one? Take care ya hehe!